6881 US-98, Pensacola, FL 32507 Cactus Flower Cafe is a Mexican restaurant with locations in NW Florida and Alabama taking great pride in serving delicious California Style Mexican Cuisine. Our Mexican food is fresh, flavorful, delicious and healthy … served in a relaxing and appealing atmosphere. 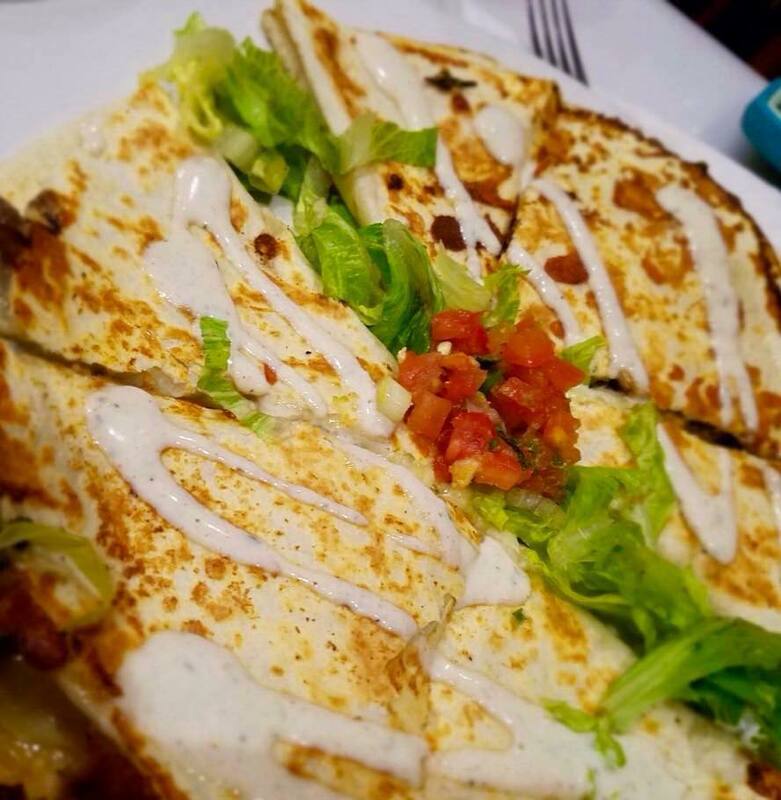 Two flour torillas with meat or bean filling of your choice and a mound of creamy cheeses topped with fresh pico de gallo and Santa Fe sauce. Beef, Chicken, Pork, or Vegetarian. Our original queso made with 100% creamy Monterrey Jack cheese, fresh cream, fresh jalapenos and spices. Add our smash beans/black beans for an amazing queso experience - .99. Our taco shells are made here! 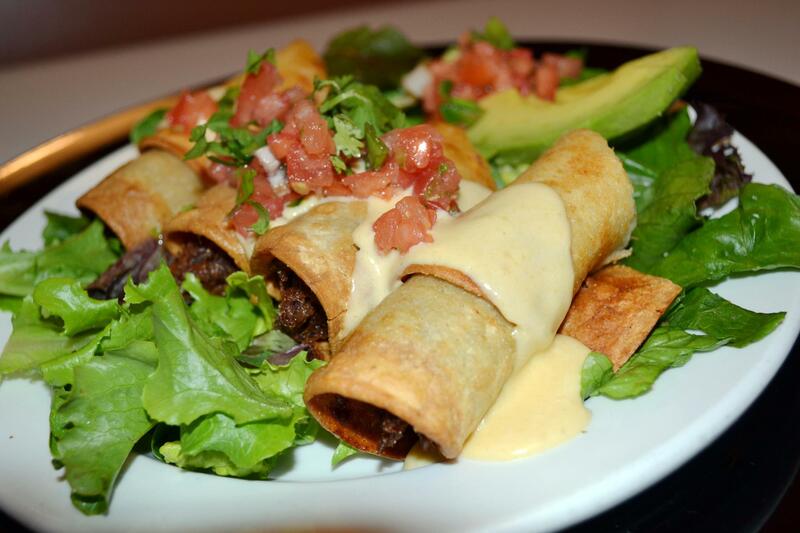 Two shells made your way, filled with meat of your choice, greens, cheese, pico and drizzled with Santa Fe Sauce. Rice and Beans. Beef, Chicken, Pork or Vegetarian. Steak, Shrimp or Fajita Chicken – 2.99. Called “El Jefe” (The Boss). 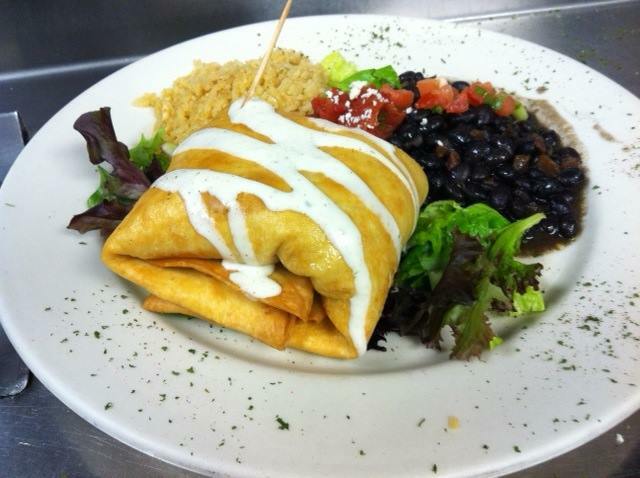 Filled with your choice of meat, rice, beans, Monterrey Jack, Santa Fe, pico de gallo and crispy greens! Beef, Chicken, Pork or Vegetarian. 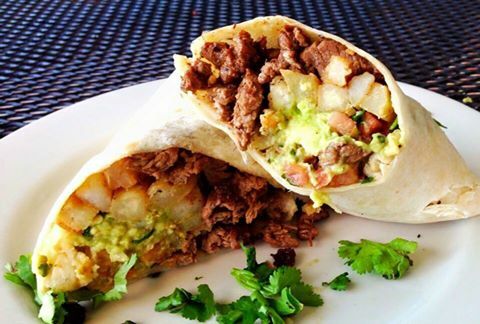 San Diego started this burrito craze with steak carne asada, natural fries, melted cheddar cheese, fresh guacamole, salsa Verde and pico de gallo all wrapped into the perfect meal! Includes choice of beans and rice OR cup of soup. Heavenly, golden pockets stuffed with Monterrey Jack cheese, smashed pinto beans and jalapenos. Served with Santa Fe sauce for dipping. Four per order. Truly traditional! Rolled and baked enchiladas made with our red Mole sauce made from New Mexico chilies, filled with meat of your choice and creamy cheeses. Rice and Beans. Chicken or Beef. Served with meat, cheese, beans and rice wrapped up in a burrito. Corn tortillas filled with either shredded beef or chicken, then flash fried to perfection topped with creamy queso and a side of guacamole. 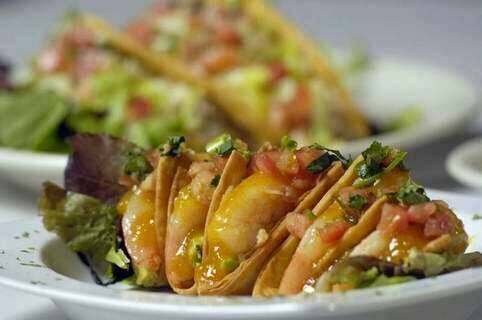 Five jumbo shrimp placed in miniature flour taco shells and finished with fresh guacamole, cilantro, pico de gallo and our amazing sweet & spicy mango salsa. A whole, fresh avocado with pico de gallo and spices. Made to order. Crispy tortilla chips served with our choice of meat and beans, creamy queso, fresh guacamole, green onions, olives, jalapenos and pico de gallo. Add meat $1.99. Add beans $.99. A hearty chicken soup bursting with flavor and zing. Chicken, Monterrey Jack cheese and cilantro topped with toasty corn tortilla strips and a fresh squeeze of lime. A hearty red soup of ground beef, pinto beans, fresh tomato, onions, cilantro and Monterey Jack cheese….a fresh twist to chili! 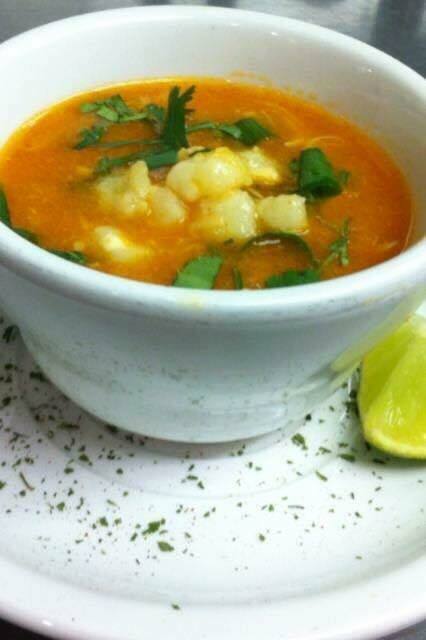 Our traditional, thick and rich hominy stew in a spicy base made from red chilies shipped from New Mexico. Garnished with lime, scallions and cilantro. Roasted corn makes this creamy dreamy soup a delicious meal. Spicy and velvety. Garnished with cilantro and green onion. Served with slices of our freshly baked French Bread. Cheese on request. Plump juicy shrimp, fresh avocado, pico de gallo and lime cilantro rice on a bed of baby greens topped with our sweet & spicy mango salsa and surrounded by homemade crisp flour chips. 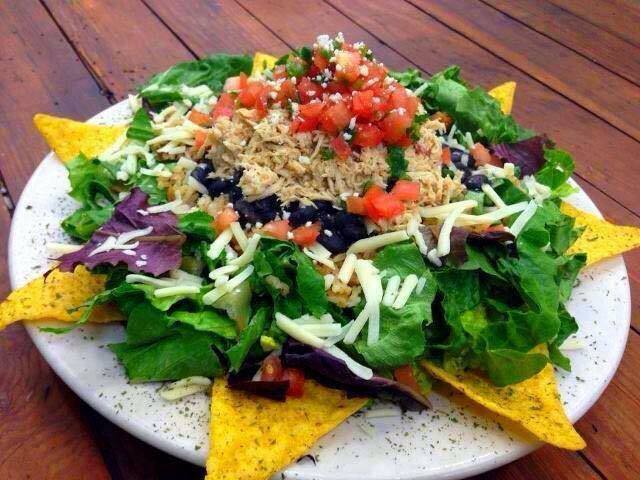 A large bed of fresh spring mix & romaine with your meat choice, rice, black beans, cheese and fresh pico de gallo. Served with your choice of dressing and surrounded with fresh tortilla chips. A fresh, light salad with spring mix and romaine lettuce topped with Monterrey Jack cheese, fresh pico de gallo and your choice of dressing. Our taco shells are made here! 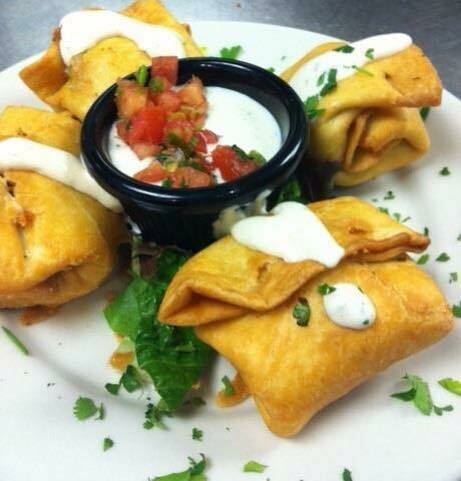 Two shells made your way, filled with meat of your choice, greens, cheese, pico and drizzled with Santa Fe Sauce. Rice and Beans. Beef, Chicken, Pork or Vegetarian. Steak, Shrimp or Fajita Chicken – 1.99. A flour tortilla filled with our choice of meat and creamy cheeses, lightly fried until golden & puffy and topped with Santa Fe. Served with rice and beans. Beef, Chicken, Pork or Vegetarian. A crispy corn tortilla shell made in house and piled high with meat, cheese, beans and greens. Smothered in our fresh pico de gallo and drizzled with Santa Fe Sauce. Served with rice and beans. Beef, Chicken, or Pork. Two in the taco shell of your choice. Rice and beans. Two tacos in the taco shell of your choice. Rice and beans. Truly traditional! Rolled and baked enchiladas made with our red Mole sauce made from New Mexico chiles, filled with meat of your choice and creamy cheeses. Rice and Beans. Chicken or Beef. 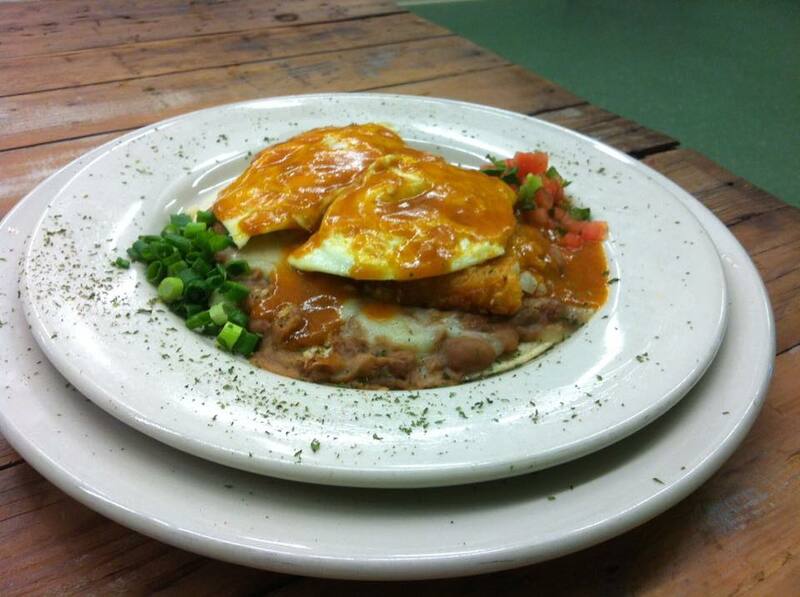 A layered delight of two eggs cooked your way, smashed beans, Monterrey Jack cheese and crispy hash browns on two soft corn tortillas. Covered in our red ranchero sauce and garnished with green onions and pico. Our famous carne asada burrito is made with tener flat iron steak, natural potatoes, cheddar cheese, green chili sauce, guacamole and pico de gallo. Served with choice of cup of soup OR rice and beans. Delicious, juicy pork tenderloin with mounds of creamy cheese. Flat grilled, covered in Verde sauce and drizzled with Santa Fe. Rice and Beans. 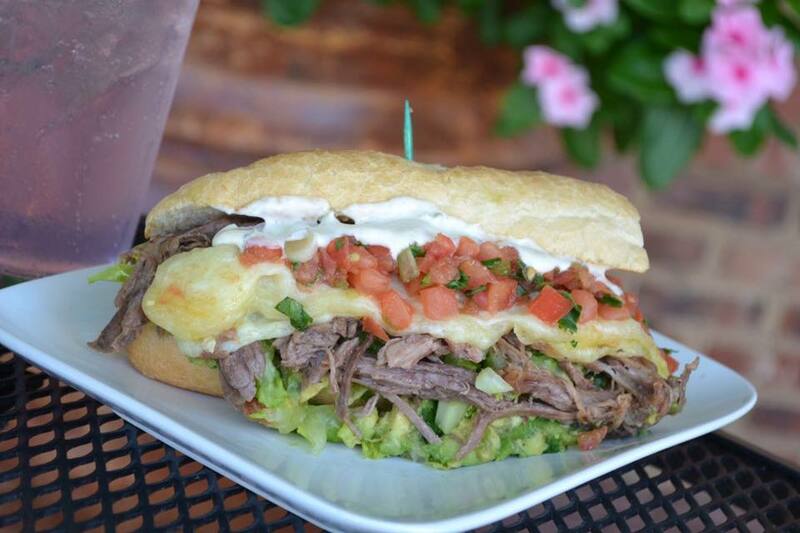 Fresh, crusty French Bread baked here daily with your choice of shredded beef, chicken or shredded pork. Spicy mayo, fresh guacamole, melted Monterrey Jack, romaine and pico. Served hot with a cup of our tortilla soup. Perfecto! The Perfect Lunch – A creamy,cheesy 6” quesadilla with a fresh, light green salad and a cup of one of our delicious soups. Chicken, Beef or Pork. 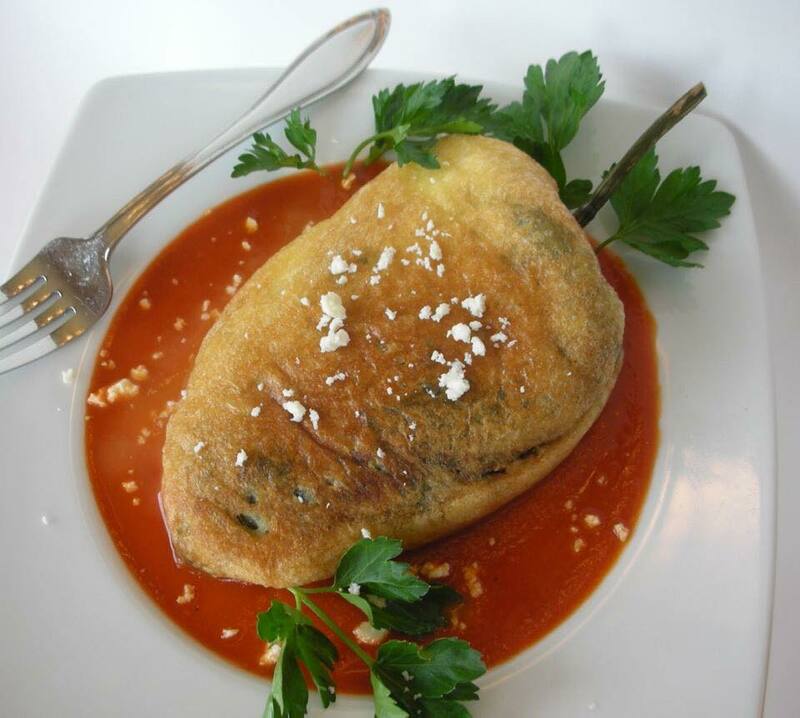 A large, plump poblano pepper overstuffed with chicken, creamy cheeses and gerbs. Covered in our Verde sauce and drizzled with Santa Fe sauce. Served with rice & beans OR a side salad. Delicious wrap with meat of choice stuffed in a flour tortilla with cheeses, grilled onions and peppers. Flat grilled, covered in Verde sauce and drizzled with Santa Fe sauce. Rice and beans. Pork Tenderloin, Jumbo Shrimp, Fajita Chicken or Mahi. Seasoned sour cream and creamy cheeses makes our green enchiladas (from fresh Anaheim and jalapeno peppers) a fabulous choice! Rice and beans. Your meat of choice with layers of Spanish Rice and basmati rices, smashed pintos, slow simmered black beans, cheddar or Monterrey Jack, fresh pico and dressing, Shredded Beef, Ground Beef or Shredded Chicken. Mahi, Shrimp, Steak or Pork Tenderloin 2.99. Grilled flat iron steak, tender and seasoned to perfection with smoked Gouda & Monterrey Jack cheeses and tomatillo Verde salsa make this quesadilla a very special treat. Served with real sour cream and our fresh garden salsa. Add plump, juicy shrimp 2.99. Grilled flat iron steak, tender and juicy...on a mountain of natural fries covered in melted cheddar, guacamole and fresh pico de gallo. Drizzled with lime sour cream. Meat'n'tater lovers this is your dish! Tender, succulent flat iron steak on a bed of baby leaf greens, romaine hearts and timbal of cilantro lime rice, chunks of creamy avocado, freshly diced tomatoes and scallions. Your choice of dressing. Served with a cup of soup. Add plump, juicy shrimp 2.99. Only children 12 and under please. With meat or beans 5.99. In a soft tortilla. Served with fries. 703. Kid's Macaroni & Cheese. Kids love this creamy dish. 100% beef hot dog and melted cheddar wrapped in a 10" tortilla, stuffed with mounds of cheese and flash fried until golden. Served with fries. Mmmm so good! Prices are per person. Minimum of 10 people per option. 24-48 advanced notice required. Your choice of Hard Shell Ground Beef Tacos & Chicken Santa Fe Enchiladas OR Mexican Salad & Quesadillas. Includes Spanish Rice, Choice of beans, Chips & Salsa, Sour Cream, Choice of Tea, Ice, Paper Goods (plates, napkins, cutlery kits), Cups, Serving Utensils. Price is per person. Select quantity of people with the minimum being 10 people. Your choice of Hard Shell Ground Beef Tacos & Chicken Santa Fe Enchiladas OR Mexican Salad & Quesadillas. Includes Spanish Rice, Choice of beans, Chips & Salsa, Sour Cream, Choice of Tea, Ice, Paper Goods (plates, napkins, cutlery kits), Cups, Serving Utensils. Also comes with Chocolate Gooey Butter Cake!!!! Price is per person. Select quantity of people with the minimum being 10 people. Your choice of Hard Shell Ground Beef Tacos & Chicken Santa Fe Enchiladas OR Mexican Salad & Quesadillas. Includes Spanish Rice, Choice of beans, Chips & Salsa, Sour Cream, Choice of Tea, Ice, Paper Goods (plates, napkins, cutlery kits), Cups, Serving Utensils, and your choice of Queso Dip OR Guacamole. Also comes with Chocolate Gooey Butter Cake!!!! Price is per person. Select quantity of people with the minimum being 10 people.